When I saw that the Koch Brothers were major backers of The Vietnam War, I suspected that Ken Burns and Lynn Novick were not going to use any of the newly declassified files concerning President Kennedy and his plans for withdrawing from Vietnam. I have been exposed to enough literature and discussion from the wealthy, organized Right to understand that the mere mention of Kennedy’s name causes something akin to bug-eyed rage. But I hoped against hope that the film would at least be fair to President Kennedy. Well, Burns and Novick might be decent people, but the best I can say about them in this regard is that they were not going to bite the (many) hands that feed them. In Part One, Burns and Novick noted Kennedy’s visit to Saigon in 1951. And they mention his meeting with a journalist there, Seymour Topping. Like Kennedy’s meeting at the time with State Department official Edmund Gullion, Topping told the congressman that the French effort there was not winning, but losing the war. And the image of the US paled badly in the eyes of many Vietnamese because they were allied with the colonizers. The film then depicts Kennedy writing a letter to his constituents about the wrong-headedness of the American position, which would likely become a lost cause. As with the Burns and Novick attempt to camouflage through anonymity the perpetrators behind direct American involvement in Vietnam, this strophe discounts the record to the breaking point. To elucidate just one element: Kennedy did not write just one letter to his constituents about our ill-fated alliance with France. That visit to Saigon had a transformational impact on his entire view of European colonialism in the Third World. It’s important to note that although Burns and Novick use Kennedy’s phrase about the Viet Minh being everywhere and nowhere, they do not attribute it to him. It is hard for this writer to believe that Burns and Novick are not aware of that speech, for the simple reason that it created a mini-firestorm in both the press and at the White House. Kennedy specifically went after Secretary of State John Foster Dulles and Vice-President Richard Nixon. There were 138 editorial comments on the speech, over 2/3 of them negative. (ibid, p. 21) Kennedy was not just personally counter-attacked by Foster Dulles and Nixon, but by Stevenson and Acheson—members of his own party. The reaction was so violent that Kennedy told his father that he might have made a costly error. But Joe Kennedy replied to his son that he did not know how lucky he was. Algeria was going to get worse, and he would then look like a prophet. Which is what happened. That speech dealt with one of the same subjects that The Vietnam War deals with: the perils of America allying itself with French imperialism. One would therefore think that Burns and Novick should have noted it, especially because it fills in the background of what Kennedy did in Vietnam once he became president. It is not noted at all. Kennedy’s lonely six-year campaign to alert members of each political party to the importance of this issue, and the folly of what Eisenhower and his administration were doing—all this is reduced to one letter. When I saw what the film had done with this clear record, I began to wonder what Burns and Novick were going to do with the pile of new documents that had been released on the Kennedy administration and Vietnam since 1994 and the advent of the Assassination Records Review Board. Those hundreds of pages of documents, plus the research done on the subject by several authors and essayists, has created a whole new lens to look at this issue through. But when I saw that the film had almost completely muzzled Kennedy’s background on the issue, I then thought there were two paths left for the film to follow in regards to Kennedy and Vietnam. The first would be to introduce this newly declassified material out of left field, thereby making it rather jarring to the viewer; the likely reaction being: “Gosh, where is this guy coming from?” The second avenue would be simply to ignore this new scholarship and act as though it did not exist. Unsurprisingly, The Vietnam War took the latter path. Authors like Mahoney, Philip Muehlenbeck, Robert Rakove, and Greg Poulgrain have written entire books based upon new research into this subject. This new scholarship demonstrates how President Kennedy almost immediately broke with the Dulles/Eisenhower regime in places like the Congo and Indonesia. Again, using the above authors’ work would have demonstrated that what Kennedy was about to do in Vietnam was pretty much of a piece with his foreign policy in the Third World. Burns and Novick present not a word of it. What do they present instead? Kennedy as some kind of conflicted Cold Warrior. They cherry-pick parts of his inaugural address in order to do this. 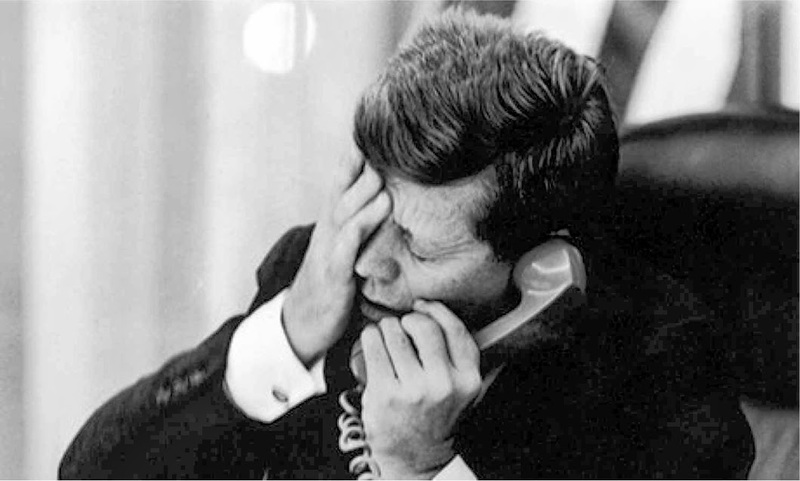 They then say that after the Bay of Pigs, his confrontation with Nikita Khrushchev in Vienna and the construction of the Berlin Wall, Kennedy felt he had to draw the line somewhere, and that place was Vietnam. So after sending Walt Rostow and Maxwell Taylor to Saigon to gather information on what the conditions were like there, Kennedy then commissioned thousands more advisors into the theater. In doing so, the film pretty much eliminates the entire two-week debate in the White House where Kennedy faced off against virtually his entire cabinet and foreign policy advisors. As authors like James Blight have noted, for those two weeks, virtually every other voice in the room wanted to commit combat troops into Vietnam. The president was the only person holding the line against it. In Blight’s book Virtual JFK—co-edited with Janet Lang and David Welch—he spends over forty pages dealing with this landmark episode. And he produces the memorandum by Colonel Howard Burris (Johnson’s military aide) which memorialized Kennedy’s arguments against inserting combat troops. (Blight, pp. 281-83) These arguments included the facts that Vietnam was not a clear cut case of aggression as was Korea; America’s most important allies—like England—would not support such a move; the French effort, with hundreds of millions of dollars, had failed; combat troops would not be effective against guerillas and, in fact, would be quite vulnerable to attack. To say the least, Kennedy’s arguments look prescient today. 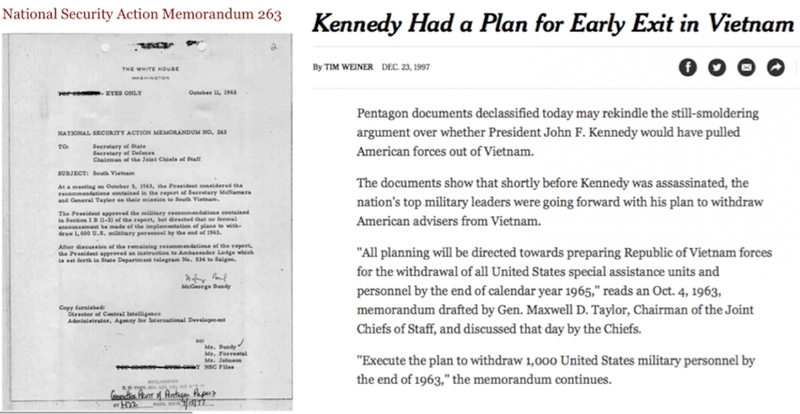 As the film notes, after the debate, Kennedy did sign off on National Security Memorandum (NSAM) 111. This allowed for more advisors and equipment to aid Diem’s army called the ARVN [Army of the Republic of Vietnam]. A good question could have been raised at this point. During the lengthy debate, the Hawks had expressed their pleas in the most dire terms: namely, that South Vietnam would collapse without the insertion of combat troops—and lots of them. Bundy had requested tens of thousands, Secretary of Defense Robert McNamara had asked for hundreds of thousands. (Blight, p. 71, p. 280) If such was the case, how was Kennedy’s plan to send in more advisors going to salvage Saigon’s imminent fall? There is a parallel here with the failed Bay of Pigs invasion. After the first day of that doomed venture, when it was apparent all was lost, Kennedy was asked by both the CIA and the Pentagon to send in the navy to save the day. He refused. The film does not acknowledge that symmetry. Or the message implicit in Kennedy’s limited aid package: the US could help Diem, they could extend weapons and supplies. But they could not fight his war for him. There is a famous quote about how strongly Kennedy framed this question to Arthur Schlesinger. What the film does with this key quote is revealing. It includes only the first part of it, where JFK told Schlesinger that committing combat troops would be like taking a sip of alcohol: the effect would wear off and you then had to take another. But it eliminates Kennedy’s much stronger punch line: “The war in Vietnam could be won only so long as it was their war. If it were ever converted into a white man’s war, we would lose as the French had lost a decade earlier.” (Goldstein, p. 63) Could anything make the issue more clear? Congressman Kennedy had seen the folly of our effort to aid the French position in their war in Indochina. But he saw that France had overextended itself: that they had no real political base and therefore had to send in a land army to fight Giap’s guerilla war. He was not going to repeat that mistake with American troops. He was not going to be perceived as continuing a colonial war in the Third World. As mentioned above, Burns and Novick note Kennedy’s signing of NSAM 111. But they do not relate what else Kennedy did at this time. As James Blight has noted, all the indications are that Kennedy was shaken by the fact that he was almost alone in resisting the siren song of inserting the Army and Marines into Indochina as the main fighting force. (Blight, p. 281) Contrary to what the film implies, that cabinet was not unilaterally picked by JFK. It was done by committee, one that included Clark Clifford, Richard Neustadt, Larry O’Brien and Sargent Shriver. (Ted Sorenson, Kennedy, p. 258) For this reason, Kennedy decided to go outside that circle of White House advisors to enlist an ally. He notified John Kenneth Galbraith, ambassador to India, that he wanted him to visit Saigon and write up a report on how he saw the situation. Kennedy knew full well what Galbraith would say: namely, that we should begin to distance ourselves from Saigon. (Blight, pp. 69, 361) Then, when Galbraith arrived in town in early April, Kennedy sent him to see Bob McNamara to brief him on his report. The ambassador reported back to the president that he had achieved his mission and that McNamara was now on board. (ibid, p. 370) As several commentators have noted, e.g., Gordon Goldstein and John Newman, this was the beginning of Kennedy’s withdrawal plan. What does the film do with this very important background maneuvering by Kennedy? It reduces it all by simply saying that Secretary of Defense McNamara announced in the summer of 1962 that America was making progress on winning the war and therefore a gradual withdrawal of American advisors could begin and be completed by 1965. This camouflages two important points. First, it conveys the idea that this was McNamara’s initiative. Second, it also implies that Kennedy and McNamara both thought they were actually winning the war. Both of these tenets are wrong. McNamara had to be convinced upon Kennedy’s orders to begin this plan. It was Kennedy’s plan, not McNamara’s. Secondly, there is simply no credible evidence that either of them actually thought the American effort there was militarily successful. How could McNamara think so if just six months earlier he had recommended over 200,000 combat troops be committed into Vietnam? If you don’t mention it, you don’t have to explain it. Coinciding with all this is what is probably the most important document declassified by the ARRB. McNamara held regular meetings of the Saigon chiefs of agencies and the Pentagon in Hawaii. These were called Sec/Def meetings. For the one in May of 1963, he had requested that each agency and military chief bring with him their withdrawal schedule. After he had looked them over, he said they were too slow and would have to be speeded up. There was no qualification by McNamara that this withdrawal was hinging upon an American “victory” and there was no contingency plan mentioned to reinstate troops if the victory was not in sight. In fact, General Earle Wheeler wrote that he understood that any request for any overt action would be denied by the president. (Probe Magazine, Vol. 5, No. 3, pp. 19-21) These documents were so compelling that even The New York Times bannered a story with the headline: “Kennedy Had a Plan for Early Exit in Vietnam.” (ibid, p. 19) One would think that if it were good enough for that paragon of the MSM, the Grey Lady, it would be good enough for Burns and Novick. Needless to say, none of these documents are shown in The Vietnam War. Neither is NSAM 263 exhibited. This was the order drawn up in early October of 1963 that delineated the withdrawal plan and mandated that a thousand men be returned from Vietnam by the end of 1963. The story of how the order and the report it was attached to were created is revealing, and would have been informative to the viewer. By the autumn of 1963, JFK now had everything in place to activate his withdrawal plan. But he wanted to send his two highest military advisors to Saigon, that is, McNamara and Chairman of the Joint Chiefs Maxwell Taylor. He trusted McNamara, but not Taylor. Therefore, while those two were in Vietnam, Pentagon higher ups General Victor Krulak and Colonel Fletcher Prouty were invited to the White House. Bobby Kennedy met the duo. He instructed them, upon orders of the president, that they would actually edit and compose the Taylor/McNamara report at his direction. (John Newman, JFK and Vietnam, p. 401) Once that was done, it was shipped out to Hawaii and given to Taylor and McNamara in bound form. Kennedy was not allowing for any alterations. I shouldn’t have to replay this refrain by now: None of this information is in the film. But as Burns pronounced on Marc Maron’s radio podcast of September 11th : History is malleable. Sort of like bubble gum, right Ken? Both Halberstam and Sheehan were enamored with Vann, even though they understood he was an “essentially conservative, at times [an] almost reactionary man.” (Halberstam, p. 164) In their film, Burns and Novick have Sheehan tell us that, upon his own arrival in Saigon in 1962, he believed in American ideals and the alleged US mission in South Vietnam. He also believed in the dangers of the “international communist conspiracy”. Sheehan then adds that he was there to report the truth in order to help win the war for the betterment of the United States and the world. He describes going along on ARVN helicopter missions as being part of a crusade: he was thrilled by the experience. These attitudes made Sheehan and Halberstam easy targets for Vann. And negatively complementing that, it guaranteed that they would completely miss what Kennedy was doing. Colonel Vann was a veteran of Korea and, by 1963, had served in the military for twenty years. With Sheehan’s help, Burns and Novick spend several minutes outlining the January 1963 Battle of Ap Bac, an important conflict that Vann helped plan and supervise. Although the Viet Cong were outnumbered by a large margin, even though the ARVN had helicopter support and used armored personnel carriers, this battle turned out to be, by any accounting, a losing proposition for Vann. Saigon lost 80 dead, more than one hundred wounded, and five helicopters destroyed. The Viet Cong lost 18 dead and 39 wounded. Vann was deeply angered and confided the true facts of the defeat to his students Sheehan and Halberstam, who both wrote about the failure of the battle. The film does not reveal a key reason for that failure, one which Vann himself had discovered. Ngo Dinh Diem had issued orders to his field commanders not to initiate large offensive operations that would provoke serious casualties. Vann’s intelligence officer, Jim Drummond, concluded that the ARVN had not really checked the growth of the Viet Cong or the area under their control. (John Newman, JFK and Vietnam, p. 299) In other words, contrary to what the commander in Vietnam, General Harkins, was saying, America was not winning the war. And Ap Bac was living proof of that. The reason that Sheehan and Halberstam admired Vann was simple: like him, they were Hawks. And like him—and opposed to Kennedy—they wanted more American involvement, not less. This is easily discernible by reading Halberstam’s 1965 book The Making of a Quagmire. That volume is perhaps the single most complete and coruscating condemnation of America’s Vietnam policy published to that point. It attacks every element of the American mission in that country and also the policies and personages of the Diem regime. (See Chapters 3-5) It then goes on to expose the ineptness of the ARVN (Chapters 5-7), in particular how bad Colonel Hunyh Van Cao was. The latter actually gets his own chapter: 10. Why so hard on Cao? Because Vann was the advisor attached to him, and—as with Sheehan—Vann was Halberstam’s hero in 1965. Why? Because he knew how to win the war. (See Chapter 11) So for Halberstam, when Vann departed, things got worse. (see Chapter 12). Of course, when the wishes of this troika—Sheehan, Vann and Halberstam—were fulfilled, we saw what happened. Direct American involvement ended up being an epic debacle. As many as 3-4 million people were slaughtered amid almost unimaginable horror. All in pursuit of a false goal that was not possible to attain. In other words, Kennedy was right and Vann, Sheehan and Halberstam were wrong. But neither Halberstam nor Sheehan could ever admit that. It is especially startling that Halberstam never saw the parallels of what happened in both Congo and Vietnam after Kennedy was killed: In Congo, the Agency and LBJ switched sides and joined the imperial interests; in Vietnam, the Pentagon and Johnson now broke Kennedy's strictures and eventually imported 540,000 combat troops, making it an American imperial war. Truly puzzling that he would miss all of this. Under pressure from the Times and Sheehan, Lane’s book was withdrawn from circulation. This is the man Burns and Novick use as the main talking head in their segment on the Kennedy years. With their defense of the Dulles brothers as “decent people” in Part One, the disappearance of Kennedy’s withdrawal plan and the championing of Vann and Sheehan in Part Two, so far the net value of this documentary is something less than zero.